Healthy digestion is a cornerstone of good health but what is the key to good gut health? Bacteria – millions of which inhabit the digestive tract breaking down food for digestion, helping to propel food through the digestive tract and providing protection against harmful invading organisms. Foods that are high in fibre, rich in nutrients such as omega-3 fatty acids, or that contain live probiotics, will encourage the growth of health-promoting bacteria colonies and support overall equilibrium balance in the digestive tract. Here are 10 foods that can promote good gut health. As cabbage is shredded, salted and left to ferment for a period of time, acid-loving bacterial species start to multiply and grow. During this process, total dietary fibre increases, as does the vitamin C, and B vitamin content. Look for brands that are unpasteurised and don't contain vinegar (which inhibits fermentation). Alternatively, make your own pickled vegetables. 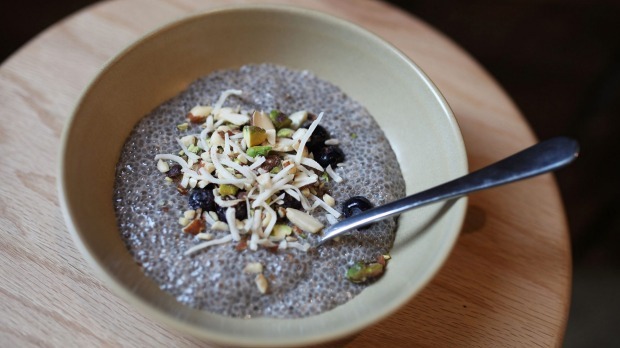 Chia seeds are among the highest plant-based sources of omega-3 fatty acids, protein, antioxidants and fibre. The fibre found in chia seeds is 80 per cent insoluble meaning it does not dissolve in water and provides roughage as it passes through your digestive tract, to help keep you regular. Berries are an excellent food for digestive health. They provide a good source of fibre, antioxidants, and polyphenols, which can selectively favour beneficial colonies of bacteria in the digestive tract. Recent research on polyphenols has shown they interact with beneficial species of bacteria (similar to pre-biotics, which "feed" the good bacteria). The interactions encourage healthy bacteria growth. All types of berries, whether fresh or frozen, contain polyphenols. Bone broth has long been considered a traditional remedy for soothing digestive complaints and improving ailments. An article appearing in a 1938 medical journal on the benefits of gelatin claimed "the most important piece of equipment in any kitchen, is the stockpot". Home-made bone broth has been shown to contain large quantities of glucosamine and chondroitin sulfate, which help to repair the defensive barrier in the gut mucosa and sooth gastric inflammation. It is also packed with valuable minerals, as well as gelatin; a hydrophilic colloid that attracts gastric juices, and stimulates digestion. Seaweed is rich in trace minerals and is a good source of fibre. Brown varieties also contain a high fibre compound known as alginate. Look for seaweed found in the kelp family (kombu, sea palm and wakame). Cruciferous vegetables (kale, cabbage, broccoli and silverbeet, to name just a few) are excellent foods for gut health; they provide various phytonutrients, vitamins and minerals, as well as a good source of fibre. Phytonutrients can benefit the gut by increasing the balance of good bacteria and also contain anti-inflammatory and anti-oxidant properties. Yoghurt should always taste sour, not sweet. The sourness is a reflection of the lactic-acid bacteria that have developed during the fermentation process in the milk. Regular consumption of yoghurt can positively influence the balance of microflora in the gut, creating more of the "good guys", such as lactobacillus and bifidobacterium probiotics. There is nothing quite as nourishing as a bowl of "Jewish Penicillin" or "Mama's Perfume" for a stomach ache, cold or flu. Chicken soup is made with a base of healing bone broth (see point four), it also contains well-cooked, easily digestible vegetables and plenty of fluid, which helps hydration. A small handful of studies have shown that traditional chicken soup contains anti-inflammatory components, which soothe the mucosal barriers in the stomach and nasal passages. You can also add various herbs and spices – such as ginger, turmeric and garlic, which contain anti-inflammatory and anti-microbial properties. Oily fish – such as salmon, sardines and mackerel are an excellent source of omega-3 fatty acids, such as EPA, and DOHA. These fatty acids can play a vital role in healthy bowel function. They can work to lubricate the digestive tract and keep digestion flowing smoothly. They can also help to reduce inflammation and strengthen the intestinal lining, which can help to protect against gastrointestinal diseases. Ginger is a traditional spice, revered throughout Asia for its ability to relieve gas and reduce abdominal bloating. In herbal medicine, it is considered to be an "intestinal spasmolytic" – in other words, a substance that can relax and sooth the digestive tract. The active component of fresh ginger, known as gingerol contains anti-inflammatory and anti-microbial properties, which can alleviate symptoms associated with gastrointestinal discomfort. In various trials, it has been found to be a more effective remedy for motion sickness and morning sickness when compared to a placebo.